The 3x6 provides a large space of 18m2, they are very versatile, easy to put up and transport and made to a high standard with a durable powder coated steel framework and heavy duty waterproof fabric. One of our best sellers due to pricing, size and build quality. 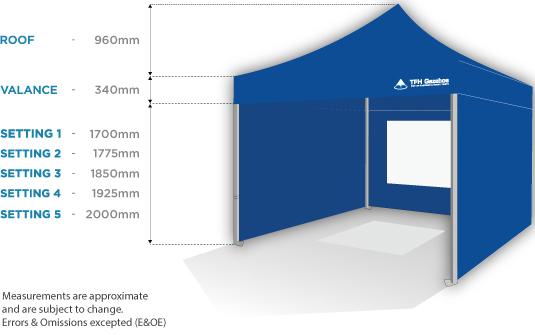 These 3m x 6m Pop Up Gazebos are very popular, and widely used for Shows & Events, BBQ's, Boot Fayres, Emergency Services, Motorsport, Food & Drink Catering, Hog Roast & Promotional Trade Stands. No tools are required to set up the gazebs, just fit the roof cover, extend the frame open, extend legs to desired height, fit the sides if required and restrain the gazebo using the tie down kit supplied or by using weights which can be purchased separately.